We have a total of six yurts in four different locations on the ranch. Equipped with a wood stove, cozy futon couch, coffee table dining area and two bunk beds with a double on the bottom and single on top, the yurt offers a serene and uncommon sanctuary for 6 people. The kitchen is stocked with dishes, cutlery, pots and pans as well as a sink complete with hot and cold running water. A propane refrigerator, stove and lighting ensures you have all the comforts of home! An outdoor shower with hot water and an outhouse completes the experience. PLEASE NOTE: THE YURTS ON MINNIE LAKE ARE CLOSED FOR THE 2019 SEASON. Situated across the lake from our popular Salmon Lake Resort, this yurt puts you right on the shore of this popular fishing lake. You are welcome to enjoy all the amenities at the resort including the swimming pool, playground and store. It is a 10 minute drive into the yurt (4x4 is recommended) or travel between the Salmon Lake Resort and yurt by boat. The yurt at Salmon Lake is a nice peaceful retreat, only a few minutes away from all the action! Wasley Yurt #1 and Wasley Yurt #2, are spaced quite far from each other to ensure total relaxation and complete privacy. They are the only accommodations on this lake and our private dirt road (4x4 required) is the only drive in access! Wasley Lake is infamous for hosting extremely large rainbow trout to the patient angler; average is 3 pounds but fish over 10 pounds have also been caught. Please be prepared for a 1.5 hour drive from Home Ranch to reach the location of these yurts. Also known as Mellin Lake, Jerry's Lake is the former location of "Jerry's Cabin". Private and secluded, this will again be a popular fishing destination. Mellin Lake is known for it's fast and furious fly fishing for rainbow trout in the 1-2 pound class. This is an exceptional fishery for all skill level of anglers. A stay at Minnie Lake Yurt No.1 is a pleasant experience to say the least, be sure to book your stay in advance. (TEMPORARILY CLOSED FOR THE 2019 SEASON). Minnie Lake Yurt No.1 is the only structure on Minnie Lake, located right on the shores of famed destination. As many know, this lake is rated among the top fly fisheries for rainbow trout in all of Canada. 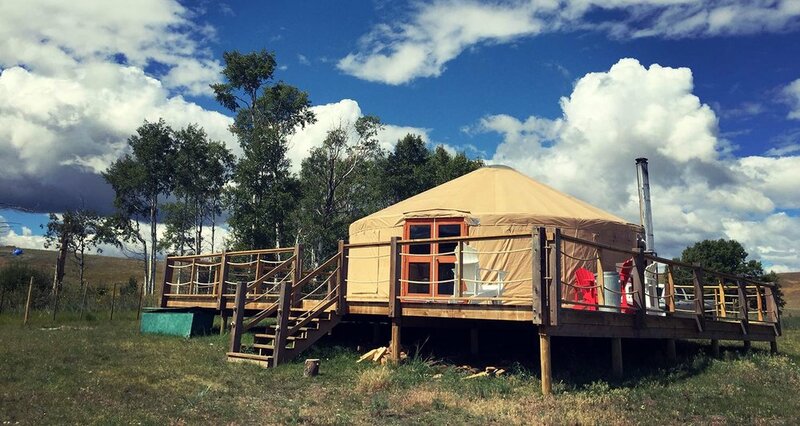 Staying in a yurt is a great way to get in touch with the outdoors, with minimal environmental impact. Experience world-class fly fishing and enjoy the comfort of our largest and newest yurt on the Ranch. (TEMPORARILY CLOSED FOR THE 2019 SEASON). This is the newest of the Douglas Lake Ranch yurts and is located at the far south protected bay on Minnie Lake, not far from it's famed waters. The rental cost of this Yurt includes rod fees on Minnie Lake. This is a 30’ Yurt, which is slightly larger than the other Yurts on the property. Please contact Douglas Lake Ranch for rates and information regarding our yurt rentals.